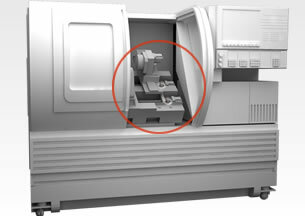 Like all CNC equipment, CNC lathes require both high speed and exceptional precision to function at their peak. Because they’re engineered for high accuracy machining, every moving part in a CNC lathe must be precisely controlled or the benefits of CNC machining will be lost. Miki Pulley offers a full line of motion control solutions for CNC lathes and other CNC devices. In the example shown here, Miki Pulley SFF-N couplings are used to join servo motors to shafts. These shaft couplings are specifically designed for high speed machine tool applications, making them perfect for CNC machinery. Capable of operating with high torque values and at speeds in excess of 20,000 RPM, SFF couplings maintain zero backlash on starts and stops, ensure precision movement of the CNC machine’s work head. The high torque rating of SFF couplings makes them ideal for spindles and feed shafts on CNC lathes and other machine tools. Exceptional torsional stiffness and strength ensures accurate shaft rotation and precise control. A flexible element gap helps dampen conductive heat transfer from motors to output shafts. A wide variety of options are available for our SFF couplings, including single- and double-element configurations, tapered shafts, custom-specified lengths, and keyway milling. 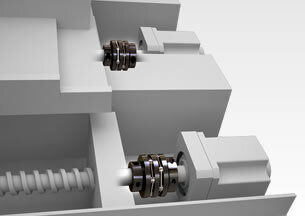 Numerous options can be combined to give you a shaft coupling that meets your unique requirements. Request a quote on shaft couplings, shaft brakes, or other motion control solutions for your CNC lathe applications. Or, contact Miki Pulley for more information.